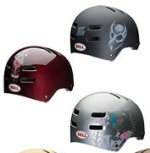 The Bell Faction Helmet is skate inspired with superior style fit and comfort. As ridden by a whole host of BMX and Skate Super Heroes, the Faction is perfect for street, dirt, or riding ramps. 12 vents for good cooling, Dual density foam liner with thicker foam at the front for greater impact resistance where it is most needed, High impact ABS shell for maximum protection and excellent resistance to knocks and scrapes, Plush internal padding and adjustable straps to ensure the perfect fit, This helmet will stay looking good whatever you throw at it, Available in 3 sizes to suit all heads, Weight: 426 grams, Meets CE EN1078 and ASTM 1492 skate certification.